The Snowman and more from a picture book legend. Go walking in the air – and beyond! There are no picture books more classic than Raymond Briggs’s timeless tales. They’re magical, mysterious, happy, sad: books that reach every emotion. 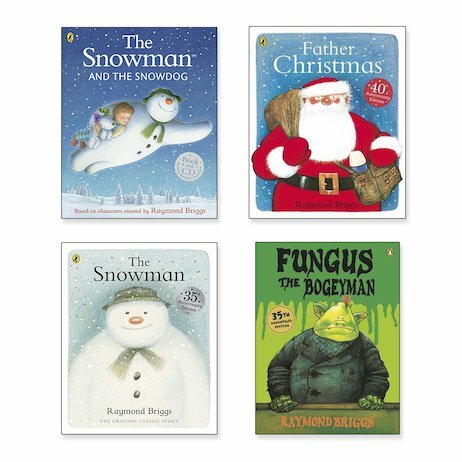 If you loved watching The Snowman on TV, go back to where it all started with these heartfelt tales for little ones. Winter wonder with the Snowman. Festive giggles with a grumpy Father Christmas. (He’s sick of boring old presents. He’d much rather sit on a beach.) Plus the original yucky favourite, Fungus the Bogeyman. If you love The Dinosaur That Pooped or Morris the Mankiest Monster, see where they got their inspiration from!